PASADENA, CA--(Marketwire - April 13, 2010) - Humans have long looked at scientific advances, natural disasters or societal disorder and come to the conclusion that the end is near. Contemporary society and culture is no different. The most popular end-of-the-world scenario at the moment is based on the calendar of a vanished society. 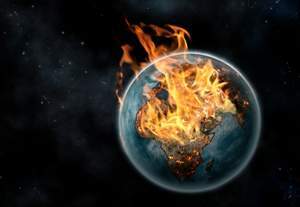 In a new article by Vision.org titled, "2012: The end of the World (Yet Again)?" writer Peter Nathan discusses the enduring interest in doomsday. He notes that "average people of all descriptions tend to be at least somewhat interested in speculating about future events and the possible demise of civilization as we know it." The same idea was referred to on March 30, 2010 when the world did not end. The proton collision at the Large Hadron Collider on the border of France and Switzerland was greeted with excitement by a small community of scientists and followers, but the Earth-swallowing black hole many others feared was not produced. The writings of Nostradamus have often been used to support apocalypse predictions. Nathan states, "The 16th-century seer's writings, recorded in quatrains, or poetry in four-line format, are flexible enough to support any of several apocalyptic scenarios that are being put forward today." Nathan adds, "People have often used Nostradamus to bolster their own apocalypse predictions, though so far his mystical verses have proved most accurate when superimposed onto past events." In "2012: The end of the World (Yet Again)?" discussing this interest in time-ending calamity, Nathan asserts, "It is as though something in the human genome makes us understand that all is not right with the human condition; we witness, incessantly and with glaring detail from even remote parts of the earth, the suffering and death that are so much a part of life. We just know that some change needs to take place for humanity to accomplish its rightful place in the universe." In a related piece, "Mayan Mayhem: Is 2012 the End of the World?" contributor Dan Cloer concentrates on the focal point of the 2012 end-of-the-world scenario. While an apocalyptic reading of the Maya Long Count Calendar is most popular at the moment, some offer the opinion that the Maya saw 2012 as a time of renewal. Addressing the differing views of the calendar's meaning to the Maya, Cloer notes that "just as many voices warn of our own global plight today, the Maya themselves weren't listening. They apparently did not let this hope of a rebirth stop them from self-destruction." For more on this end of the world scenario, visit vision.org. Vision.org is an online magazine with quarterly print issues that feature in-depth coverage of current social issues, religion and the Bible, history, family relationship topics and insights into philosophical, moral and ethical issues in society today. For a free subscription of the magazine, visit http://www.vision.org.